Our friends Andy & Darcy got married this past weekend (Congrats Guys!) and both of us were honored to be in the wedding party, Amber as a bridesmaid and myself as the best man. As an additional duty that I bestowed on myself I decided to organize a group gift among our Rochester friends. Andy and Darcy have been together long enough that they have most of the things you need to run a household, which meant that they really only needed a few small things and couple big things. We of course decided to go big and bought them a Blue Ember Grill with just about every bell and whistle a person could ask for. However through the generosity of our group (and the large number of people that contributed) we had enough funds to buy the grill, every grilling implement known to man, a fire pit, and even a chefs hat for the cook. A large haul by anyones standard, but how to package it? Such a large gift deserves more then a simple card and bow, that is when genius struck. Adam: Hey Jon, I had an idea for how we should package the gift. Adam: I was thinking that we build a box large enough to fit the grill and all the other gifts inside. Adam: We would have to make it HUGE, like 7’x7’x7′ just to make sure we can fit the 6′ wide grill inside. Adam: We can put it on their deck, wrap the entire thing and make some ribbon and a bow out of fabric to make it look like a gift. Jon: You’re an idi……. Can we fill it with balloons? We had this crazy idea 4 days before the wedding, which meant that to pull it off we would need to find a group of people as crazy as us, people willing to put in long hours building something thats entire purpose was to be destroyed, people willing to work for pizza and laughs. Luckily, Rochester is just dull enough that we convinced a good chunk of our friends to help out. 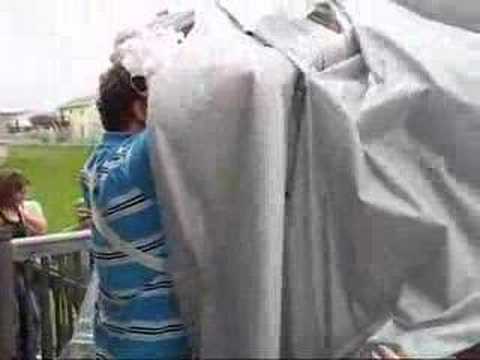 After putting out a plea for cardboard, purchasing a crap-ton (it’s metric) of 1×2’s, finding silver table cloth rolls to use as wrapping paper, and getting strange looks by going alone into Jo-Ann’s (picture a large guy perusing the fabric section in the middle of the day) to get “ribbon”, we were set. We gathered 2 days before the wedding to pre-assemble as much of the box as possible. The plan was to frame nine 3.5’x7′ panels, cover them in cardboard, and individually wrap them. The tenth panel was the exception, it included a door so that the contents of the box could be accessed and would be wrapped on location after the box was assembled. One of the best times when doing a project like this, is the moment when everyone buys into the idea (still realizing that it is completely absurd and insane). As I watched 11 people work for 2+ hours on this completely crazy idea I couldn’t help but think how hard it was going to be to convince them to help assemble it after the reception, being past 1 AM and having partied and drank for hours. But we had come to far, so this box was going up! The wedding was of course beautiful, went off without a hitch, the women all beautiful and the men handsome. The reception was a blast, everyone danced more then they should have, ate more then they should have, and some even drank more then they should have. However, that is not the purpose of this post, all that is important is that everyone was well dressed, tired, sore, tipsy, and it was 1 AM. It took another two hours but we got the box up (with the magic power of zip-ties), put in the gifts, filled it about half full of balloons (over 300), wrapped the visible surfaces one more time, slapped on the bow, and at around 3 AM called it good. Were we tired? Hell Yes, But we had accomplished something! We had build a completely useless, but impressive, 7′ gift box. Now all that was left to do was to go home, get my 5 hours of sleep and goto the gift opening in the morning. Luckily there is video of the remainder of this story, so I can stop typing and you can stop reading. The reaction was completely worth the effort and I would do it again in a heartbeat. Congratulations Andy and Darcy!